During the tail end of their recent European tour, Brooklyn’s A Place to Bury Strangers made a visit to Lovebuzz Studio to put together a Fuzz Club Session that was intensely recorded in one live take. From that very session comes the debut of the noise-rockers’ new track titled “Chrome Shadow,” which will be included in the band’s highly limited, vinyl-only release of their Fuzz Club Session LP. 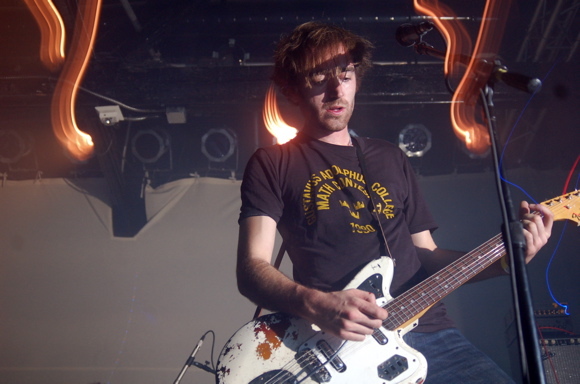 In April 2018, A Place to Bury Strangers released their fifth studio album, Pinned, that included tracks like “Never Coming Back,” “Excution,” and “One Of US.” The album enjoyed a remixed version titled Re-Pinned, and sent them on the European tour that eventually led them to their Fuzz Club recordings. In addressing their live session, founder Oliver Ackermann expressed his excitement for recording at the end of a tour as it “pushes things to the next level” and motivates the band to reinvent.